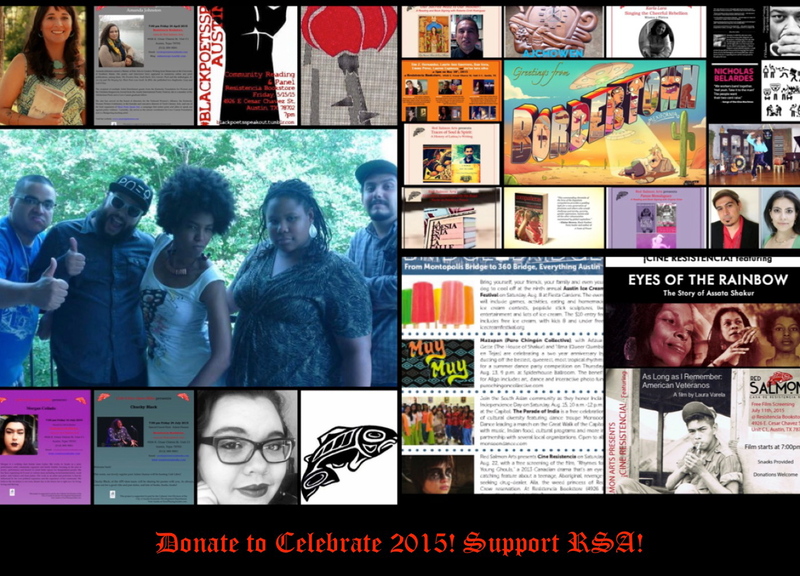 Donate to Celebrate 2015! Support RSA! Consider donating an end-of-year, tax-deductible contribution to Red Salmon Arts (RSA) to promote our mandate of sustainability, autonomy, and self-reliance. Your support will allow us to grow, revise, and thrive! The monies we raise benefit our long-standing programming such as Café Libro, Cine Resistencia, Save Our Youth, and the Touring Writers Series. The funds also support our partners, which include: Barrio Writers, Flor de Nopal Literary Festival, and Texas Peace and Dignity Journeys 2016. Last, we are grateful for any amount to compensate the reduction in one of our grants and assist us with our daily operations and maintenance, which will allows us to keep our doors open. 3. Support our events, screenings, lectures, and other related programming and bring a friend.